FREE TAPING MANUAL INSIDE - Step by step kinesiology tape application guide for your best results. You don't need to be a physiotherapy kt expert to use the SPARTAN TAPE. SPEED UP YOUR RECOVERY AND ENJOY FREEDOM FROM PAIN - recover faster due to increased kinesio blood circulation and reduced inflammation. The SPARTAN TAPE is designed to move with you, stretching when you stretch and flexing when you flex while providing long lasting gentle support therapy and aiding blood circulation to promote faster healing. WATERPROOF AND LIGHTWEIGHT TECHNOLOGY - When properly applied, the SPARTAN TAPE can stay on through 3-5 days of showering, crossfit workouts, gym sessions and beyond. This athletic tape does not irritate skin, because it is hypoallergenic and latex free. ORDER NOW - YOU HAVE NO RISK WITH OUR 100% GUARANTEE - If, for any reason, you don't like your SPARTAN TAPE kinesiology tape, simply return it for a hassle-free, no questions asked refund. No catches no hassles you're always protected. INCREASE YOUR ATHLETIC PERFORMANCE - The SPARTAN TAPE enables your muscles to more easily get back to neutral shape and is designed to work with your body and flex with your muscles to support, not restrict the area. It also gently lifts the skin to promote better blood circulation for increased sports performance. Is the pain restricting your active life? "Fell the strength, be the strength'' SPARTAN TAPE Kinesiology Tape will let you enjoy freedom from pain again! 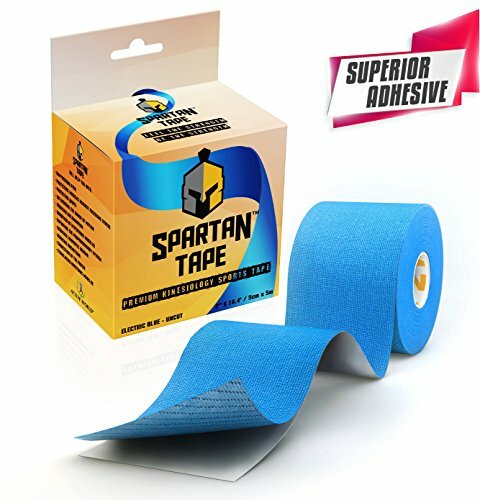 SPARTAN TAPE special KT tape benefits: Drastically reduces pain and lets you enjoy activities previously avoided by your painful injury. Reduces recovery time after injuries by reducing inflammation, decompressing the affected area and increasing kinesio blood circulation. Protects your body from common sports injuries by allowing your muscles to get back to neutral shape more easily. Jump, squat, run SPARTAN TAPE Kinesiology Tape easily flexes together with you. Swim, sweat, shower - moisture won't affect your waterproofed SPARTAN TAPE. SPARTAN TAPE Kinesiology Tape is safe, hypoallergenic and latex free. High quality cotton lets your skin breathe and will not irritate your skin. SPARTAN TAPE is easy to use. The included kinesiology physiotherapy taping guide helps you tape your body correctly. IS IT FOR ME? SPARTAN TAPE Kinesiology Tape is perfect for young and old, professionals and amateurs, pregnant women, gym lifters, literally ANYONE with an active lifestyle! SPARTAN TAPE is perfect for Hiking, Running, Cycling, Mountain Biking, CrossFit, Martial Arts, Yoga, Golf, Tennis, Boxing, Weight Lifting, Swimming, Athletics Well... You get it... Any sport! SPARTAN TAPE Kinesiology Tape will help you with knee pain, shoulder pain, elbow pain, arm pain, wrist pain, back and lower back pain, neck pain, ankle pain, foot pain, abdominal pain, pain in bicep, tricep, quad, calf, rotator cuff, tennis elbow, carpal tunnel, achilles tendonitis, shin splits, hamstring strain, plantar fasciitis and much more! ORDER Yours NOW by clicking Add to Cart button at the top of this page and enjoy the freedom from pain! Important notice: we are sorry if we go out of stock due high demand. We try our best to keep up.